The Samsung Galaxy tablet has room for only seven Home screen panels, maximum. Each panel has room for so many icons, depending on the size of the tablet. For example, a Galaxy Note 10.1 has room for 48 icons on each Home screen panel. An 8-inch Galaxy Tab 3, on the other hand, has room for only 30 icons on each Home screen panel. Obviously, at some point, you’re going to run out of room for apps on the Home screen. Actually, you won’t run out of room for app icons as long as you employ the concept of app folders. An app folder is simply a collection of two or more apps, both in the same spot on the Home screen. 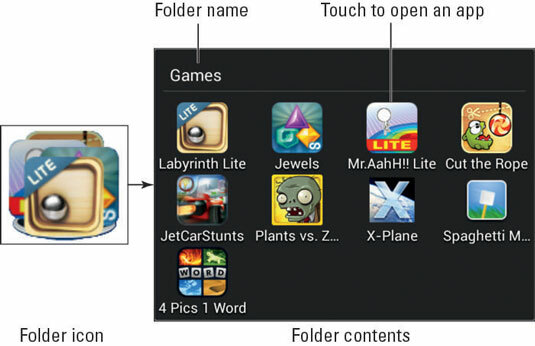 Here is an example of an app folder on the Home screen, shown both closed and open. On the Home screen, touch the Menu button. Touch the OK button to create the newly named folder. The folder is created, but it’s empty. Drag icons into the folder. Move icons from the Home screen into the folder. You can drag icons into the folder also from the apps screen. Open a folder by touching it. You can then start an app by touching its icon. With some tablets, you can quickly build a folder by dragging one app icon over another. The two icons appear inside a black oval. Folders can be created also by dragging an app icon to the Create folder icon. Folders are managed just like other icons on the Home screen. You can drag them around by long-pressing them, and you can delete them. Change a folder’s name by opening the folder and then touching the folder’s name. Type the new name by using the onscreen keyboard. Add more apps to a folder by dragging them over the folder’s icon. To remove an icon from a folder, open the folder and drag out the icon. When the second-to-last last icon is dragged out of a folder, the folder should be removed. If not, drag the last icon out, and then remove the folder.